the loss of his son with his wife, Brittens Captain (Laura Innes) has partnered him with rookie Efrem Vega (Wilmer Valderama), as he works things through with kind, objective therapist Dr. John Lee (BD Wong). 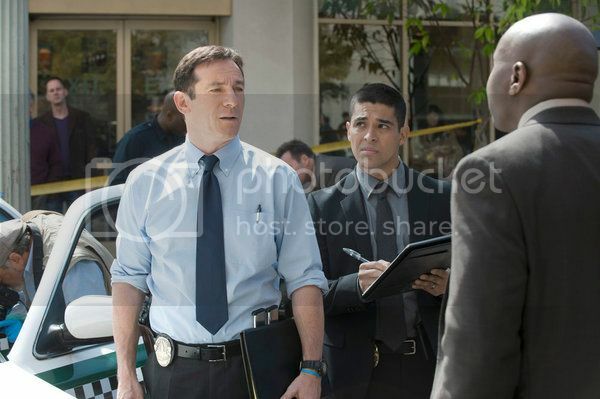 In this still from an episode of 'Awake,' Detective Britten works with partner Detective Freeman (foreground) as his partner from his other reality (background) looks on. Juggling two worlds might seem complicated (and exhausting) enough, but life for Detective Britten gets even more muddled. Soon sliding with regularity between his two new worlds, he takes various clues from one to solve crimes in the other, even as his behavior in both becomes more erratic and precarious. And while the pilot flawlessly establishes the landscape of Brittens new reality, future episodes will slowly chip away at it, leaving the viewers with many unanswered questions and mysteries. Is Britten simply dreaming one of these worlds? If so, which is his true reality? Is either? Could they both be a lucid dream? Could it be that both his wife and son died? And while later episodes can sometimes veer a bit too much into standard procedural fare, they also offer a thunderbolt of a plot point, suggesting that the car crash that took Brittens family may have been no accident at all. Given how quickly the last truly ambitious network sci-fi drama (Heroes) veered into absurdity, the steady pacing and erudite plot development of Awake is an almost welcome relief. We look forward to dreaming for many episodes to come. The sleep science behind the thought-provoking concept of Awake excited us a lot, but we wanted to get deeper answers to some of our most basic questions about the neuroscience of sleep, and just what it is that Michael Britten might be suffering from. To do so, ScriptPhD.com sat down with Dr. Alon Yosefian Avidan, the Director of the Sleep Disorders Laboratory at UCLAs Department of Neurology. ScriptPhD.com: Dr. Avidan, for people reading this that may not know very much at all about sleep science, can you give us a brief laypersons overview of what the scientific consensus is on what sleep is for, exactly? Alon Avidan: There is no answer. We dont understand the central reason for why we need sleep. But we know one thingwe cant do without it. There are about 13 theories that help explain why we sleep. The theories range from needing it to have better memory akin to letting your computer organize files in its sleep mode, so the brain is doing that same thing in your sleep; organizing thoughts, memories and allowing space for new ones to be formed. Another theory is that sleep has a rejuvenating function, essentially for repair, for better immune function. There are other theories that sleep is a hibernation period during which you dont really need to eat or look for food and its a way for you to reserve your energy. This is probably, evolutionarily speaking, back when humans were foraging and needing to conserve energy. There are some theories that sleep is a way for us to synchronize our bodily functions with the Earth. There are really not that many things that we humans are capable of doing during the night, and this is a time for us to synchronize our biological rhythms with that of the Earth. SPhD: So regardless of which of these theories is true, extreme sleep deprivation has really bad consequences. patients in the same age group. SPhD: Well, turning to some of the sleep issues in Awake, our main character, Michael Britten, vacillates between two different sleep states, both of which function as his reality, in order to cope with the loss of his wife, son or possibly both. How much do we in fact use our subconscious as a coping mechanism for the traumatic things that happen to us in our lives? AA: Thats a very interesting point. We know that people who are depressed spend a lot of time in bed, they tend to spend a lot of time sleeping, but their quality of sleep is disrupted. And perhaps it is a coping mechanism for them not to deal with the true conflicts or trauma that are occurring in their lives. Whats very interesting is that in those patients, when they do sleep, sleep is very disrupted. The quality of sleep related to depression or anxiety is really bad. They have arousals, they have awakenings, the duration is short, and the quality of sleep is very light. They often wake up and feel as if they havent really slept. SPhD: What about the dream aspect of sleep in this patient sub-population? AA: Dreams are when healthy individuals reach the REM cycle (which you know is when we dream). You can have dreams in non-REM cycles as well. Whats interesting is that patients who have post-traumatic stress disorder or anxiety, their dreams are frightening. Theyre usually nightmares. Studies show that in many patients who have a very profound trauma like 9/11 survivors in New York City, there was an epidemic of nightmares and stressful sleep experience. Dreams are not normal in patients who have psychiatric disorders, and they are more dramatic and more intense dreams. SPhD: In the show, Mr. Britten takes clues from one sleep state to solve his crimes in another sleep state (either of which he considers a reality). One of his therapists warns him that doing this is incredibly dangerous because his unconscious is unreliable. What do you think the therapist meant by that? AA: So whats likely happening to him clinically is that hes unable to distinguish between sleep and wakefulness. And what is being advised is be more careful not to rely on facts that may be occurring in dreams or wakefulness, because he is not aware which state this is arising from. SPhD: Is there something to that piece of advice? What about people who regularly swear by premonitions or things they see in their dreams? AA: Clinically, we really dont see that very often. We dont see patients relaying a sense of reality between sleep and wakefulness. There is a situation that is neither a sleep state, nor wakefulness, but a combination of the twothe patient has lost sense of what is real and what isnt. Dissociative fugue disorder is a rare psychiatric disorder where the patient loses their sense of reality, their sense of identity. And it does have something to do with sleep because its one of those mixtures of sleep and wakefulness when the patient is unsure of whether they were asleep or awake. It involves extensive memory loss, usually into the wakefulness period, and the person just doesnt have the capacity to determine what is real and what is fiction. So, what you are describing with this police officer, he could have this sleep disorder (or something similar) rather than a primary sleep disorder. In the sleep literature, we dont have patients who strictly come in and lose the perception of sleep and wakefulness and have no other psychiatric issues. What youre describing is a patient who has a fugue, and may have dream episodes that are very profound, but his underlying primary pathology is a psychiatric one. And there is usually something that crosses this person into the fugue state, and the one thing that does it is usually a major life event that is very stressful. Or a condition in which the patient has such a severe depression that they have no sense of reality because they have a borderline personality and they forget what is realtheir sense of reality is so profoundly sad and full of tragedy that they cant accept it, and are thus creating this lucid state in which they exist more comfortably because they dont need to deal with the tragedy in their lives. We want to thank Dr. Avidan for taking time to chat with ScriptPhD.com and give his thoughts on some of the sleep science pertaining to Awake. What about the recent ABC show “Life on Mars”–ostensibly time travel but covering similar “reality/unreality” territory. Although they really went off the rails as they needed to wrap things up. Thanks for the recommendation, bd_sd! “Life on Mars” could also definitely be considered another great network sci-fi drama from what I’ve heard about it. It doesn’t sound like it was really ever given a huge chance to develop. I’ll be sure to give it a look via Netflix, though!